Marco Hernandez had another good week, going 5 for 14 with two home runs, a stolen base, and three RBI. His home runs came in back-to-back games, and he is now hitting .259/.284/.341. Coinciding with his addition to the 40-man roster on Friday, SoxProspects.com Executive Editor Chris Hatfield tweeted about positive reports he has received on Hernandez from the Dominican. Hernandez's Licey teammate, Jonathan Aro, went two innings and allowed an earned run on a hit, a walk, and a strikeout. Roman Mendez entered in relief for Este during a 15-inning game and surrendered two hits but no runs. Rafael Devers did not play this week. In a quiet week in Venezuela, left-handed reliever Luis Ysla made two appearances but threw just 2/3 of an inning while allowing no runs, a hit, and a walk. Right-hander Jorge Marban added 2 1/3 innings and gave up one run. Sitting for the week were pitchers Edwin Escobar, William Cuevas, and Rob Wort. That latest chapter in Christian Vazquez's quest to pick up offseason at-bats began this past week. After seeing his San Juan team fold before the season started, and later asking for his release from Mayaguez due to a lack of playing time and travel issues, the rehabbing catcher debuted for Santurce this week. He pinch-hit in one game and started another, going 0 for 6 on the week. 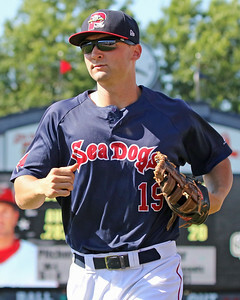 Hard-throwing right-hander Pat Light saw action in three games in a week that also saw his addition to the 40-man roster, going 2 1/3 innings while allowing just one run and striking out two. His Caguas teammate Henry Ramos went 3 for 12 with a pair of doubles and a pair of walks. Shortstop Jeremy Rivera saw action in four games for Mayaguez, three of those as a pinch runner and/or defensive replacement at third base, and another in which he went 0 for 2 as a defensive replacement in right field. In the semifinals of the inaugural Premier12 Tournament, Zeke Spruill came up big for the U.S. He got the win after going five innings and allowing just one earned run on a solo home run. He walked two and struck out three. The U.S. would eventually lose to South Korea in the championship game. Luis Alexander Basabe had a terrific week that included seven hits, two doubles, and three walks. His slash line stands at .444/.559/.667 in 27 at-bats this fall. His fellow outfielder Lorenzo Cedrola also had a nice week with nine hits including two doubles and a home run. His line stands at .352/.435/.500 in 54 at bats on the season. Raiwinson Lameda tore it up as well with seven hits, a triple, and nine RBI. He's hitting .336/.396/.511 in 131 at bats. Isaias Lucena also went 3 for 5 with a home run on Wednesday and is hitting .309/.315/.456. Deiner Lopez, playing for Lara, had a big week, going 7 for 12 with a double. Hildemaro Requena turned in a nice outing by going five innings allowing just one run with three strikeouts. He now owns a 1.78 ERA this fall. Angel Padron lowered his ERA to 1.11 after tossing five scoreless innings as well.